Kuta is littered with Ralph Lauren Polo Shops. These clothes are manufactured in Indonesia and the Chinese owner distributes them for a fraction of the cost across Indonesia. The Polo rider logo has three legs instead of the original four and the cut is a bit different. Otherwise they are identical to the genuine ones. Welcome in the age of globalization and cheap textile production! My Christian friend and a Hindu taxi driver compared during a trip the various religious festivities. They agreed that Hindus and Christians have fun religious festivities whereas Moslems only have boring and dreadful religious celebrations which often include fasting. Both of them did not like the Moslems for this reason. The Indonesian TV broadcasts during Moslem holidays religious program both my friend and the driver find boring. An Indonesian friend of mine had a day off and so she took me to on a two hours drive to the foot of the volcano Kintamani. Normally tourists, like I did in May, visit just the hill-top overlooking the caldera of the volcano Kintamani and eat in the Chinese restaurant (do you hear the commission rupiahs ringing?). We instead drove over a tiny winding road to the village of Kintamani with its lovely hot springs. The hot spring resort overlooks the Badur lake and is situated at the foot of the mighty volcano. The hot springs were very, very tranquil and we enjoyed every second. 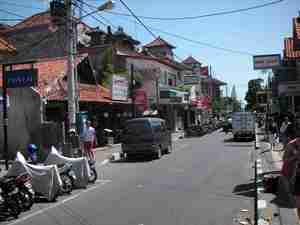 In the afternoon we drove back to Ubud, the artistic and cultural centre of Bali. On the way we stopped at the legendary Begawan Giri estate. This splendid resort is located beside the holly river Ayung (like the Four Seasons Sayan) and caters to the rich and famous with guests like Madonna, Sting and Paul Simon, who whose there just two weeks ago. Each suite has its own butler who makes sure you do not accidentally meet any other guest. Privacy is paramount. Well, best to check out the pics and get a feeling for this amazing resort. Back in Ubud we visited the Monkey forest which gets its name, well, from the many monkeys living there. You can buy bananas at the entrance to feed the monkeys. My companion advised me strongly against it but I bought some anyhow. The monkeys are very aware of the treats tourists bring so they sometimes take the initiative and pick the bananas themselves right out of your pocket. A monkey thought that the tissues in my pocket look interesting so he jumped up my leg and grabbed in a second the tissues from my pocket. Another monkey even jumped on my friend’s back and she was fearful to get rid off the monkey on her back (hey, anyone getting the play of words?). Indonesians every now and then struggle with the English language. So a money changer quickly becomes a “monkey changer” (hey, we were inclined to try to change the monkey I got off my friend’s back) or a Tourbilion watch becomes a “Troubling” watch. Experience quiet, peace and happiness embedded in the sacred river valley of Ayung near Ubud at the Four Seasons at Sayan. Before this becomes a cheesy commercial check out the pictures and be amazed. I am! Last night I had a chat with Alexander, the resort manager of stunning the Four Seasons at Sayan near Ubud. He is Indonesian and has worked in India for a few years. I joked that being God in Bali is quite boring because you get only worshipped if people want something from you. He then explained to me that Balinese people worship every God during the year whereas Indian people have their own respective God they worship according to caste and rank. If you move up a caste or rank you switch Gods, simple as that. So back then he was asked all the time who “his” God was, what puzzled him. In the Khmer empire for example religion changed by changes in kings between Hinduism and Buddhism. So there were several iconoclastic reactions when Buddha were destroyed or altered into Hindu Gods. In some temples, including Angkor Wat, you can still see the scratching of Buddha. The question that is still puzzling nowadays about the Khmer empire, or the Aztec or Egyptian, is how those kingdoms managed to align a whole culture and population to devote their time in building breathtaking monuments. Monuments that still stand after several hundreds years and where built with outmost care. How can you motivate a society and create such a powerful believe system that hundreds of impressive temples with enormous details were built over centuries? Today I spent exploring the wonders of East and South Bali. It is a fairy-tale country with each household having its own temple which is also a meeting ground and celebration area. Imagine that: Temples everywhere! But look for yourself in my photo album! Imagine a place where happiness guides your soul, where smiles are the primal way of communication and where attention to detail is astonishing. Where space and peacefulness are happily living beside each other and where life shows its gentle side. Welcome to Four Seasons at Jimbaran Bay. Get massaged, scrubbed, wrapped, soacked and oiled in the Spa. Enjoy a cool dip into the many pools and choose from a wild variety of food (and see the Japanes indulge in Pizza, pasta and Udon Noodles). But first and foremost, let your sorrows and worries behind. Give your sould and heart a rest and be inspired! For more pics, please see my photo album.